A few months ago my girlfriend Emma DeLira unexpectedly took over as Interim Women's Cross Country Head Coach for Pomona Pitzer Colleges. While undoubtedly a great opportunity, there was a daunting amount of work and planning to do before the season started. To start the season, the Pomona Pitzer ladies go through a tough 10 day double workout conditioning program. The ladies can be under tremendous pressure during that two week period. They somehow have to juggle moving in, starting classes, countless meetings, workshops, orientations and to top it off, training a few hours twice a day. It's no surprise Coach Emma wanted to give them a break! During dinner one recent evening we began to brainstorm some fun team-building activities to reward them for their hard work. After talking a bit, Emma remembered that I had mentioned we were putting together kits using our personal Care Bases. Conveniently, I work for one of the leading White Label Personal & Beauty Care Manufacturers in the country, Essentials by Catalina. We Manufacture Body Lotions, Face Creams, Shampoos, Soaps, and more for hundreds of small and large retailers, distributors, and other entrepreneurs. Our clients take our Bases and make them their own, adding Fragrances, Essential Oils, Colorant, Botanical Extracts, and many other Raw Ingredients to create their own, unique products. And while most of our clients are experienced crafters, soapmakers, etc., folks that have some experience working with oils and cosmetic chemicals, there are many others that do not. This group of customers has often asked us for something like a "starter kit" for our Personal Care Bases. For example, a kit that would include a gallon of our A.C. & E. Body Lotions, enough bottles with closures to fill and enough Fragrance and Color fully customize it. That way, even someone with little to no experience could whip up something amazing and better than anything they could buy at their local drugstore. I knew the second she suggested it that the team would be perfect to test out our "kit" idea! 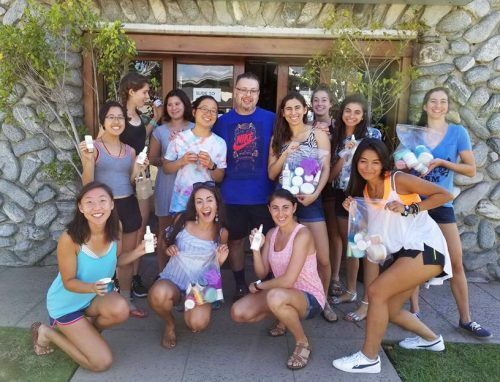 I was excited to put together a few kits for the team, knowing it would be the perfect way to see if our Bases were stable and straightforward enough to use that even a complete novice could make their own, personally customized, salon quality beauty care products. Emma was excited knowing that the team would have a great bonding experience where leadership opportunities and lessons in teamwork would naturally arise. She was anxious to see what types of personalities would arise and was hoping that the young team would start to develop team leaders that could take the incoming class under their wings. I think we were both so excited about it that we started working on that very night! We wanted to put together kits that would be useful and fun to make. Soaps, Scrubs, and a Face Mask seemed like a great place to start. Soaps were something they could use daily, considering how much running they do, so that was an easy choice! A Scrub is a must for outdoor, active people. Accumulated dirt, grime gets cleared away to reveal bright new skin gently with our Sugar & Shea Body Scrub; another obvious choice. We chose a Face Mask for the final product knowing that they would get a kick out of using them on each other days and weeks later. In our next blog post we will highlight the kits we put together and show you how creative the ladies got with their products!